A group of friends gets together to mourn the suicide of a contemporary. What is really being mourned is their youth, which, sadly for the audience, occurred during the 1960s when they matriculated at college together. What follows is a miasma of nostalgia, soundtracked ironically by Motown (there is not a black face amongst them), as a group of super-successful people (even the drug dealer has a Porsche) lament their transformation from their fantasy selves of the past (idealistic, war protesting, caring, would-be world changers) to what they have become (affluent, whiny, navel-gazing malcontents who rue their upper-tax brackets, nice homes and cars, and cushy lives). Sam Weber: So how’s your life? Karen: Oh, great. How’s yours? Sam Weber: Not so great. Karen: Ohhh, we’re telling the truth. Peace and love is easy to dispense in a gorgeous, multi-million dollar mansion, owned by Kline and his angelic wife Glenn Close. So in the ultimate sacrifice of a suburban queen, she offers Kline’s sperm to her college buddy, Mary Kay Place, who is desperate to get pregnant. Said sperm is to be delivered by Kline in the natural act. Close even stands in the hallway after delivering her gift, so proud of her selflessness she positively beams. By the way, was a decade ever so hard on someone’s hair? If you doubt it, check out Close’s ‘do in Fatal Attraction and Jagged Edge. 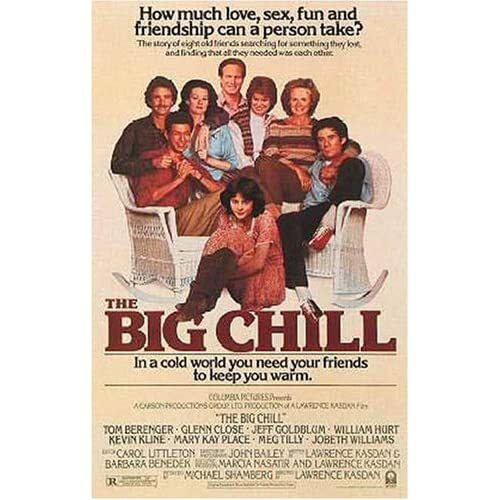 The Big Chill is made worse by the fact that it isn’t even original, but rather, Lawrence Kasdan’s big-budget version of John Sayles’s The Return of the Seacaucus Seven. The picture spawned a worse copycat, even more cloying and self-satisfied, Peter’s Friends. If you wondered what The Big Chill would be like with Brits, wonder no longer. I’ve resisted the urge to go back and watch this. Luckily, after reading your line about Glen Close in the hallway and remembering said scene, I can get on with my life. Oh, and thanks for reminding me of Peter’s Friends … another lost 2 hours I’ll be bitching about laying in a hospital bed.